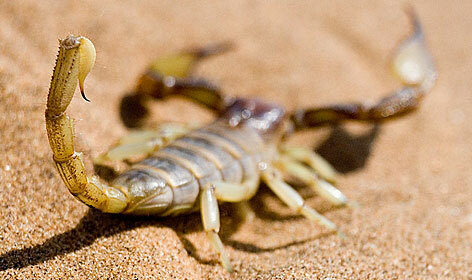 A scorpion comes to a flooded river and cannot cross, so the story goes. The scorpion asks a nearby frog to ferry him to the other side. The frog declines, fearing the scorpion will sting him during the trip. The scorpion scoffs at the frog’s fear, explaining that if he stings the frog, then both will sink and drown. The nature of politics today, it seems, is to snipe and to snark. Since most people are not professional snarkers, they come across as mean-spirited doofi (the plural of doofus). And in doing so, they become the story. A few weeks ago, former Alaska governor and GOP VP candidate Sarah Palin posted on her Facebook page (https://www.facebook.com/photo.php?fbid=10151619341908588&l=7a3e21fe6e) a photo of her 12-year-old daughter Piper celebrating her graduation, complete with balloons and snow. Palin wrote the party moved indoors so everyone could sit around the fireplace and watch the mini-blizzard. The folks at the Huffington Post (www.huffingtonpost.com/2013/05/20/sarah-palin-global-warming_n_3306867.html), as with other liberals, could not resist an opportunity to use a 12-year-old to sling an outrageous arrow at the mother for her belief regarding global warming. Nowhere in the story’s seven paragraphs did the writer offer a graduation congratulation to Piper. And, I could not find a single “way to go” out of the 209 comments at the end of the article. But, that’s their nature. As a father of two and a grandfather of two, let me offer a big Texas congratulations, Piper. It’s tough being an adolescent, and being in the spotlight because of a parent does not make life easier. If there is an award for Political Doofus of the Year, Rhode Island Democrat Sheldon Whitehouse has emerged as the front-runner. Every week, Whitehouse delivers a speech in the U.S. Senate on climate change. On the afternoon of May 20, Whitehouse rose to attack (http://youtu.be/Se3d9--KZe0) Senate Republicans and all who do not believe in global warming. If the date of Whitehouse’s speech sounds familiar, that’s because a tornado was tearing through Moore, Okla., as Whitehouse was tearing through his Republican colleagues. Whitehouse’s office issued a statement (www.whitehouse.senate.gov/news/release/statement-on-tragedy-in-oklahoma) the next day that lamely explained the senator did not know a tornado was killing people at the time. Sometimes it is better to stick with an apology rather than try to justify doofidity (the state of being a doofus). In this case, the shallow mea culpa made it appear the good people of Rhode Island have no interest in what happens outside the Ocean State, because, as implied in Whitehouse’s official statement, he never heard about the tornado that hit Shawnee, Okla., several hours earlier, killing two elderly residents, or the one that killed several residents of Granbury, Texas, the previous week. Memo to Huffington Post and Sheldon Whitehouse: We may not be able to control Mother Nature, but surely we can control the hot air that comes out of our mouths, especially at times like these. A similar memo should go to Republicans right now. Political trolls deep inside the bowels of the Executive Branch have handed the opposition some campaign contributions just ahead of the 2014 mid-term elections: spinning the terrorist murders in Benghazi, spying on journalists, targeting conservatives and religious organizations. Republican Pete Olson (http://olson.house.gov), whose Texas congressional district sits down the road from us here at the ranch, sent out a media statement (http://olson.house.gov/2013-press-releases/obama-administrations-disregard-for-the-truth-must-end) about Benghazi, the IRS, and the Justice Department (www.doj.gov) harvest of phone records of Associated Press reporters and editors. Olson used these threats to national security and civil liberties to remind constituents how he asked for the resignation of Attorney General Eric Holder over Operation Fast and Furious that allowed hundreds of weapons to fall into the hands of Mexican drug thugs and resulted in the murder of a U.S. Border Patrol agent. He again called for Holder’s resignation, this time because of the AP probe. Note to Olson: no one is going to resign because of your media statement. You just look opportunistic. When Republican politicians and conservative pundits rise up and holler at times like these, they end up being the story. But, just like the scorpion, they can’t help it. Neither can the media. And that leaves the stung American public looking up and asking why. John David Powell writes his Lone Star Award-winning columns from ShadeyHill Ranch in Texas.